…eliminate bizarre and unreasonable studies resulting in needless delays (i.e. buffalo and black fly census studies in Maine), and eliminate regulations that are incompatible with other regulations, whereby when one regulation is followed, another is violated. In that same vein, I propose that all duplicate and replicated regulations from DEP and LURC be repealed. He said "day two" of his administration, he tackles those DEP regulations, that he said often "serve no purpose except to cost businesses money. The regulatory system has been very adversarial to business and very pro-environment. "Look at Land for Maine's Future. You can't harvest timber, you can't do any cutting. No one is going to have the benefit of creating wealth and prosperity from it," he said. Many LMF projects involve easements that permit continued sustainable forestry alongside recreational uses of the land. In these areas, you may encounter active logging operations. Finally and less known is that Paul LePage’s desire to symbolically take down “Maine, the way life should be” is his personal sign off with a group called Americans for Prosperity using his tired anti-tax language to “oppose legislation relating to climate change that includes a net increase in government revenue.” It is one more example of the LePage ignore reality and forget any long-term true costs to society attitude. 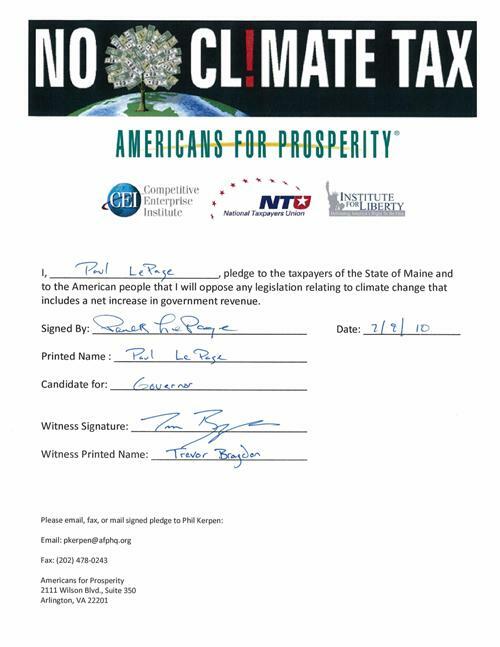 But despite the pleasant sounding name, what is this group, Americans for Prosperity that Paul LePage has pledged to support and govern us by if elected with his present non-gubernatorial signature? Well it turns out to be, as well documented and exposed in the New Yorker, basically one of many pretend grassroots organizations and tea party operations heavily bankrolled by two billion brothers, Charles and David Koch who own Koch Industries that in turn owns several forest product industries such as Brawny paper towels, Dixie cups, and Georgia-Pacific lumber. The Kochs are also longtime libertarians who believe in drastically lower personal and corporate taxes, minimal social services for the needy, and much less oversight of industry—especially environmental regulation. It is a long and twisted Maine logging road one has to travel to find where Paul LePage’s loyalties lie. And at the end of that road is a fork. On one, the sign, Maine, the way life should be still stands. That path is protected for sustainable use and travels through many places protected for our children that include good productive timber harvesting in Land for Maine’s Future, green energy jobs, and great outdoor recreational resources along with development sensitive to Maine’s quality of life that attracts tourists and new residents. Libby Mitchell is hiking far ahead on that trail already. The other direction will have Paul LePage’s sign, Maine, open for business, on it. That road will be clear-cut of our livelihood aspirations, eroded by long term environmental damage, foolishly unregulated - damaging outdoor regulation and traditional Maine forestland pursuits, primarily set aside for out-of-state interests who will export our children’s future for unsustainable immediate corporate income without regard to climate damage or consequences. That is what Paul LePage is symbolically signing us up for with Americans for Prosperity and for what his imaginary sign in Kittery represents. At a recent gathering of Republicans in Yarmouth, this is how LePage described his vision of how state agencies should work: "Instead of having people going around enforcing the regulations, I would rather have customer-friendly state employees going out and helping you abide by the regulations. I don't mind tough regulations. I just dislike an adversarial attitude by our state," he said. "A lot of people in the public education system say, 'Oh, charter schools are just going to leave us the worst students.' That might be true. But at the same token, you know what you are dealing with, so fix it." Paul LePage gave us a snapshot of how he would govern and what Maine could look like under his watch at the Waterville Rotary yesterday afternoon. According to a Morning Sentinel report LePage told his fellow Rotarians that Maine taxpayer has been "ignored and vilified" for years. Check off the “angry and divisive” box. On welfare he touted his own experience to press for a tiered program with one happy ending being: "At the end of five years, if you still need welfare, I will personally buy a ticket to Massachusetts so they can start over." There were no shreds of understanding of the circumstances of who uses the system, what exceptions are compassionately appropriate, nor where the tier of jobs needed on the other end of his plan will come from in this extremely challenging economy. Check off the “ignore and vilify the welfare bums" box. Regarding education LePage reiterated his support of charter schools and vouchers while recognizing that, "A lot of people in the public education system say, 'Oh, charter schools are just going to leave us the worst students.' That might be true. But at the same token, you know what you are dealing with, so fix it.” Check off the “starve and kick public schools” box. "In 1996, 71 percent of Marden's employees took health insurance. Today, we're down to 29 percent. Why? Because the other 25 percent that the employee is responsible for is unaffordable." This is revealing because Paul LePage became general manager of Marden's precisely in 1996. Under his leadership, company health care insurance coverage of employees fell by a whooping 42%! This smacks of a total failure to address a significant problem and at the very worst a possible purposeful plan to cut business costs on the back of employees. Marden’s obviously benefited tremendously by not needing to pay the 75% to cover the hundreds of employees that could not afford the plan according to LePage. If anything this prompts more questions about Paul LePage’s style of fiscal management. Why didn’t he create a tiered system like his welfare plan to address the problem of the 25% burden? Does Marden’s pay a living wage to begin with that allows individuals to afford health insurance? Did Paul LePage engage in the same type of shenanigans as Wal-Mart when it came to employees and health care? Paul LePage would be the worst possible kind of governor. He believes that his own mythical story can be simply replicated by anyone regardless of circumstances and economic realities. He offers no real solutions to systemic problems or addressing long term economic concerns. He seems to view Maine as primarily a few salvage boxcars of welfare fraud and education waste that he can mark down and shove out the door to save a few bucks without consequences. For Paul LePage, it will be business as usual. Paul LePage spoke to the Waterville Rotary Club today continuing his press avoidance and staying on the grip and grin circuit that shuns substantive debate and exposure on issues. This appearance, on home turf (he is a member of this particular club, 1979 to present) gave him another non-threatening setting to play candidate within. However, another LePage shoot from the hip remark should once again cause Maine citizens to be concerned about whether he is a serious Republican Party nominated candidate that can lead our state or just a tea party mascot for an anti-tax, toss-the-bums out, get rid of the welfare cheats, angry referendum that cannot control himself. "You want a governor that's not always politically correct and puts his foot in it, you've got me," he said. Is this what Maine voters really want? Do we really want to trust someone who dismissively makes light of his own lack of sensitivity and forethought? Is this the type of leadership that will help him work with the legislature, state employees, and citizens to meet Maine's challenges? Does this attitude show a genuine appreciation and appropriate degree of respect for everyone in Maine for whom he wishes to serve as Governor? One of the things heard from time to time is how refreshing Paul LePage's everyman, no frills, says-what's-on-his-mind, plain spoken approach is to some individuals. There is absolutely nothing wrong with direct, unadorned communication if it carries a message of substance. But now, after many blurted out remarks, it is clear that Paul LePage is just hammering away on a limited number of tea party anger points to hold on to a whipped up angry base while crossing his fingers that the three independents take enough votes away from Libby Mitchell to allow him to sneak through the back door of the Blaine House. It is time for Republican voters with genuine concerns about Maine's future who care about civic responsibility to openly distance themselves from Paul LePage. Their party has been hijacked and it is their party that he has put his foot in. The Sentinel piece is a PM website news update and hopefully a more substantial report will follow in tomorrow's paper. This TIME magazine poll was conducted by telephone Aug. 16-17, 2010, among a representative national random sample of 1,002 Americans, ages 18 and older, throughout America. The poll includes limited interviews with cell-phone respondents. 16 (and absolute last time we will ask this ridiculous question). Do you personally believe in the face of every bit of the extremely overwhelming, extensive, unassailable, irrefutable, incontrovertible, documented evidence that is thoroughly and comprehensively sound recorded, expansively written about across a wide variety of sources, exhaustively substantiated on film and subjected to legally sane thinking that indicates common sense that our country’s chief executive, subjected to intense scrutiny and exposure throughout his long public life, President Barack Obama, is a Muslim and are you a total nutcase perpetuating a lie for some sort of right-wing tea party inspired smearing falsehood of anti-patriotic propaganda for some gullible and selfish, fact denying, wacked-out delusional, craven and malicious purpose? As Paul LePage continues to avoid the press and mainstream Maine voters, one might ask…is it the food or the company? Pete, thank you so much for hosting the "BBQ" event. It was a pleasure meeting you and the others that attended. Paul LePage was very IMPRESSIVE. That he remained at the BBQ for approx. 3 and 1/2 hours says a lot about how he values grass roots support. I thoroughly enjoyed the one-on-one talk as people created a circle of lawn chairs to have a Q&A with Paul and to discuss issues facing Maine. Maine voters do not object to one-on-one opportunities to meet candidates. But it cannot be all one-on-one and one-on-none. Being available to Maine voters requires a healthy mixture of in person campaigning, connecting with voters through a variety of forums and debates, and being available to the press rather than hiding. Concentrating 3½ hours of time in a lawn chair circle chatting with those who echo your views while elsewhere denying a few hours to be engaged with the citizens you expect to serve as Governor is not a good example of the leadership needed and respect deserved by all Maine citizens. I respect the long history of the Republican Party. I admire Lincoln's vision, Eisenhower's leadership and Reagan's common sense. However, the values of self-reliance and rugged individualism which guided these men would have no place in today's Republican Party. I am one Republican who will still embrace individualism and will not blindly follow the new tea party GOP. The entire left – right extremist - we are dying for a centrist, fairy tale is very aptly punctured by Scott Kauffman’s sensible endorsement of Libby Mitchell. Many in the Maine media and punditry are in love with the “two-sides to every story” lazy way of looking at the gubernatorial race. The formula is that if there is a right wing extreme GOTP candidate that the opposing Democratic Party candidacy must therefore be an extreme left wing offering. And this false tale also works even better when the storyline includes a moderate hero to break in between the extremists. Kauffman gives us a dose of reality and ought to wake us up from the bedtime story above that put us to sleep. Paul LePage is an extremist and bent on dismantling the very pillars of this state’s foundations without regard to neither present need nor future progress to satisfy the extreme anti-tax crowd overjoyed at his hijacking of the Republican Party. Elliot Cutler is a fairly wealthy independent burning a lot of cash in pursuit of the Blaine House. While not an extremist, he really is a conservative who seems to be image fiddling primarily to fit into the storyline above in order to eek out a plurality victory by default. Yet it seems unlikely that he will be able to poll above 20% and his candidacy may really only serve to deliver the governorship to Paul LePage. Libby Mitchell is not a leftist extremist in way. Is she generally more progressive that the rest of the field? Yes and Maine’s citizens are more progressive than the rest of the field in a very pragmatic way. Libby Mitchell is a exactly the type of leader that will give us a no-nonsense, get the job done for Maine, set egos aside approach that Maine citizens expect. As Senate president, Libby Mitchell got things done. She worked with Democrats and Republicans to pass legislation that helped create jobs, improved our education system and moved the state towards energy sustainability. She is not afraid to make the tough decisions that will be necessary to lead our state. Libby Mitchell stands solidly in the mainstream and is the type of leader Maine needs to move forward. Libby is ready to govern. So now Republicans are jumping on the bandwagon to look at repealing the 14th Amendment to the United States Constitution. The ultra right are in love with Amendments 2, 9, and 10. Amendments 1, 3, 4, 5, 6, 7, and 8, of the "Bill of Rights" are just liberal drivel overkill. In their minds, Amendments 11 and up, and now especially 14, should all be repealed as too many constitutional concessions to modernity. Maybe the best way to go is: Ditch the 14th Amendment? Why stop there? Best read with a nice cold glass of raw milk and a heaping plate of organic Lindsey Graham crackers. While the Grand Old Tea Party nominee tries to figure out how to make the Governor’s race an angry referendum on taxes, social issues, throwing bums out, states rights, federal overreach, or anything else that might fire up his right wing base, Libby Mitchell has been quietly and competently building consensus toward solutions to Maine’s challenges. The three rivals who lost to Senate President Elizabeth Mitchell in the Democratic Party primary will lead policy subcommittees in support of her gubernatorial campaign. Former Attorney General Steven Rowe, Stanford Management Chief Executive Officer Rosa Scarcelli and former Department of Conservation Commissioner Patrick McGowan have agreed to solicit input from people across the state on topics such as jobs, energy, and education, the Mitchell campaign announced Wednesday. Each of these individuals brought unique perspectives and diverse backgrounds and supporters to the quest for the Democratic nomination. Each one had a positive vision and proposed solutions to Maine challenges worthy of further consideration. Libby Mitchell’s tapping into this talent base demonstrates a commitment to bringing people together to tackle tough issues. It demonstrates a commitment to consensus building over gridlock. And it offers a glimpse into how she will lead Maine. At the end of this campaign we are not looking for an obstructionist to obstruct nor an administrator to administrate but a Governor to govern. Libby Mitchell is not thrashing around like Paul LePage nor craftily tuning a message like Elliot Cutler; she is engaging her energies in working on jobs and business development with Rosa Scarcelli, energy and the environment with Jim McGowan, and education with Steve Rowe. And many other people with all kinds of experiences and backgrounds are working with her too. The Governor’s office is for governing and serving the aspirations of Maine’s citizens. It requires consensus building and input from all facets of Maine’s society. Without doubt, Libby, as Governor, will include leaders from across the political spectrum beyond the Democratic Party, just as she did as Senate President. This is a no-nonsense, get the job done for Maine, set egos aside approach typical of her that Maine citizens expect. Libby is ready to govern. She gets things done. that exposes his connections with Maine's ultra-far right. Republican candidate Paul LePage, the only candidate who wouldn't offer an interview for this article, said in a statement released by his campaign that education policy is best left up to local school boards. "The Race to the Top funding is not about educating kids, it is about the federal government running the education system," the statement said. "We need to be careful about accepting federal money with strings attached." The challenge for Maine with our educational system is our return on investment. Maine is in the top third of all our states in education spending, yet we are in the bottom third in results. As Governor, it will be my priority to reform Maine's educational system so that students have the opportunity to create results that correspond with our significant investment in the system. Many educational reforms will not cost taxpayers additional money. There is plenty of money in the system; it's how we choose to prioritize our spending that is impacting educational results. Increased competition will breed excellence; therefore, I support statewide choice by implementing a voucher system as well as the creation of new charter schools. The current trend in education is teaching to the test scores to boost test results. We need to eliminate teaching to national assessments and allow teachers to create a learning environment that challenges all of our students to excel to their own diverse strengths rather than a standard of mediocrity. I will not seek to have Augusta make all curriculum decisions for local school districts. I believe that locally elected school board members and parents should have input in their children's education. This includes allowing local school boards to provide guidance on classroom discussions of industry, natural resources, population, and economic development topics as they relate to the economy of the local region in which the schools reside and classrooms discussions on the origin of life with the inclusion of scientific theories. For Special Education, we should eliminate the disparity between school districts in identifying and supporting students requiring special education services. Finally, my goal as Governor will be to lower the average class size, not increase it. For example, school districts must work together to pool their resources. We fail to use our tax dollars wisely when some classes have as few as 4 students and others up to 25. A goal of 16 to 20 students is achievable with the resources we have committed to our educational system. Read it and weep, you are unlikely to see anything with any real depth. LePage does not intend to lead nor govern, he intends to dismantle. Postscript: By the way, the last phrase in the fourth paragraph, "classrooms discussions on the origin of life with the inclusion of scientific theories" was recently added to the site; so perhaps there is some evolution in Mr. LePage's policy development.